SynthMaster One is an easy to use wavetable synthesizer with an intuitive workflow. Although it shares the same engine with its bigger brother SynthMaster, it comes with new features like wavetable synthesis. With its simple layout, rich wavetable/waveform content and inspiring factory presets library, designing new sounds with SynthMaster One is a real joy. SynthMaster One runs as a VST instrument on both Windows and Mac OSX, and also as an Audio Unit instrument on Mac OSX. On Windows, it runs as a stand alone application as well. SynthMaster One comes with 500 inspiring factory presets from a world class team of sound designers: Arksun, Aiyn Zahev, Bulent Biyikoglu, Gercek Dorman, Nori Ubukata, Rob Lee, Ufuk Kevser, Vorpal Sound and Xenos Soundworks. 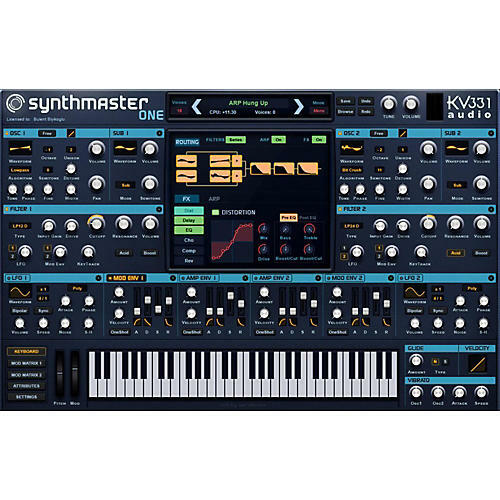 For each SynthMaster One instance, there are two oscillators with two sub oscillators, two Filters, four ADSR Envelopes, two LFOs, a powerful 16 step arpeggiator/sequencer and also 11 different effects that can be inserted on to six FX insert slots. The sub oscillators can be connected to the oscillators in five different modes which let you use it as a regular sub oscillator or do complex modulations such as ring modulation, amplitude modulation, phase modulation or frequency modulation. The arpeggiator in SynthMaster One features classic arpeggiator modes such as Up, Down, UpDown, DownUp, UpDown2, DownUp2, AsPlayed as well as Sequence, Chord and Arpeggiate modes. Each of the 16 steps of the arpeggiator has its own Velocity, Note Number, Note Length, Slide and Hold parameters. SynthMaster One implements true wavetable synthesis which opens up new possibilities for sound design. Unlike SynthMaster where you can sequence up to 16 waveforms to create a wavetable, you can import wave files that contain wavetables into SynthMaster One and use them in your projects. SynthMaster One comes with a rich wavetable library and you can extend that by placing wavetables under the Waveforms folder of SynthMaster One. Each of the 2 oscillators in SynthMaster One have stereo output, and can have up to 16 voices "unison". Using the "voices", "voices mix", "detune curve", "detune spread", "pan stread", "tone spread" and "phase spread" parameters, each oscillator can generate a rich "supersaw" type sound.